The 8-light small Willow Candelabra, part of the new Koch Candelabras Willow Series, is the final touch to a perfect presentation. The Willow Series is an unique look not found in any other candelabras on the market and can be customized to your preferences. The small Willow Candelabra comes with 8 clear glass pieces and hangars to give the ultimate look to accent your large Willow Candelabra and look great placed on the side or in corners. You can customize your look by purchasing our different color glasses (available in blue, green and red) and different types of candles (LED's vs. Floating vs. Disposable Votives). We suggest using one large Willow candelabra (FC-24WIL) as a backdrop and two medium Willow Candelabras (FC-16WIL) on the sides. The Small Willow Candelabra can accent corners and even more on the sides. You can then light your tables with our tabletop Willow Candelabra (TC-4WIL) and your aisles with our Willow Aisle Candelabras (AC-1WIL). The Koch Willow Series will dazzle your guests and provides a new and amazing look for weddings and parties. The 8-light small Willow Candelabra, part of the new Koch Candelabras Willow Series, is the final touch to a perfect presentation. The Willow Series is an unique look not found in any other candelabras on the market and can be customized to your preferences. The small Willow Candelabra comes with 8 clear glass pieces and hangars to give the ultimate look to accent your large Willow Candelabra and the small candelabra looks great placed on the side or in corners. You can customize your look by purchasing our different color glasses (available in blue, green and red) and different types of candles (LED's vs. Floating vs. Disposable Votives). We suggest using one large Willow candelabra (FC-24WIL) as a backdrop and two medium Willow Candelabras (FC-16WIL) on the sides. The Small Willow Candelabra can accent corners and even more on the sides. You can then light your tables with our tabletop Willow Candelabra (TC-4WIL) and your aisles with our Willow Aisle Candelabras (AC-1WIL). The Koch Willow Series will dazzle your guests and provides a new and amazing look for weddings and parties. 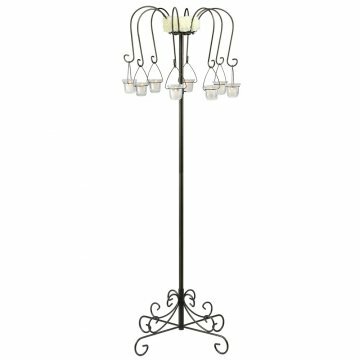 Overall candelabra size: 24''W x 24''D with adjustable height from 70'' to 88''H. Please note that due to the nature of our finishes, our candelabras and pieces can vary slightly in color between models. Our candelabras are designed to be wiped down with a dry cloth. Do not use harsh chemicals. Our candelabras come in four finishes: Gold Leaf, Frosted Silver, White and Onyx Bronze (Black/Bronze). Koch Originals Candelabras produces commercial grade candelabras designed for the rental and party industry. Don't trust your event to anything less than a Koch Originals Candelabra!